It’s time to dig out that gratitude journal from under the bed—you know, the one with the shiny gold foiling that you swore was an investment? We’ve all been enamored with the idea of being mindful, changing our lives for the better and becoming optimistic members of society. The truth is, this concept is considerably overwhelming—jotting down things you’re grateful for can feel insincere, awkward and like the last thing you’d want to do after a hard day. If you stick with it though, practicing gratitude can help you to experience more positive emotions, feel more alive, sleep better, be more compassionate and can strengthen the immune system. With Thanksgiving just around the corner, here’s how to be truly thankful for delicious turkey and much more. It takes 30 days to build a habit—so don’t worry if journaling feels alien at first. Set an initial goal to list five things that you’re grateful for every night, for one week. By acknowledging this target, you’re telling yourself that this is something you’re going to commit to. At the same time, realizing that building a habit requires dedication will allow you to recognize that sometimes life gets in the way. For example, if you know you’ll be too exhausted to open your journal at night, allocate a few minutes during the day to practice being grateful. If you accidentally skip a day, be grateful that you’ll have even more to be thankful for the day after. 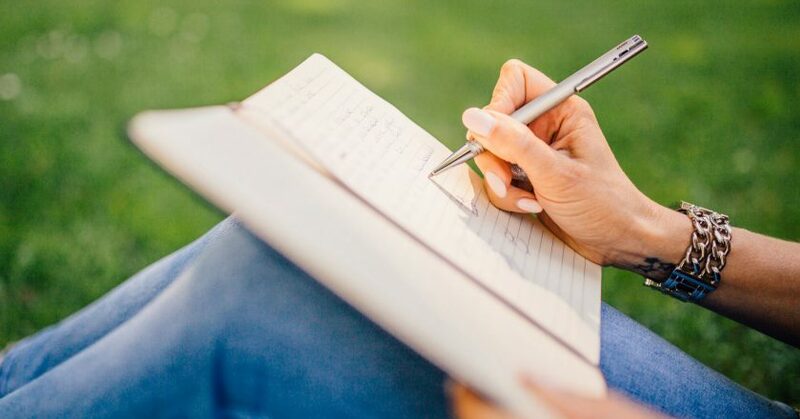 The physical act of journaling can be powerful, but it is the practice of reflecting on your day and sitting with a feeling of gratitude that will train your brain to feel happier. Being mindful simply means being conscious and aware of yourself and your environment, not that you have to sit in a lotus position with your eyes closed. Notice when you feel joy during the day, or take a few breaths at your desk to reflect on your emotions. Tracking moments that make you feel grateful as they happen, so that you can write them down later, is a fun way to stay aware and feel better throughout the day. Make it a game to find new things to be thankful for each day, so that your brain is always occupied with finding the positives around you. Did you know that writing things down has psychological benefits such as enabling you to think on a larger scale, learn more, and drastically improve your memory? Luckily, this doesn’t mean that you have to write an essay every night. The physical act of journaling forces you to consciously think about the words that you’re writing, which helps your brain to recreate feelings of gratitude and happiness. It’s also rewarding to look back and see all the things you’ve had to be grateful for over a period of time. Journaling is an indulgent hobby—it’s about communicating with yourself, and this is a good thing. Self-compassion often translates into treating others with kindness. The actual things you write about aren’t actually too important. You’re the only person experiencing this gratitude (and likely the only person reading your journal, too). Of course, you’re probably extremely grateful for your family and for having a roof over your head, but you don’t have to write those words down every night. Instead, focus on specific incidents that may have provoked small feelings. If you were grateful for a home-cooked meal, make a note of it. If you were thrilled that it didn’t rain all day, write it down. If your roommate made you a cup of tea because they could tell you were feeling low, try and scribble more than: “I’m grateful for my friends”. When you start searching for small things to be appreciative for in a particularly hard day, it enables you to see each day as a unique, positive experience. Difficult situations are often when we need gratitude the most. For example, being grateful that you learned from a situation can help you to forgive yourself. On the other hand, being aware of the power of gratitude can help you to make a conscious effort to resolve a conflict with a friend or to seek out more happiness in your life.